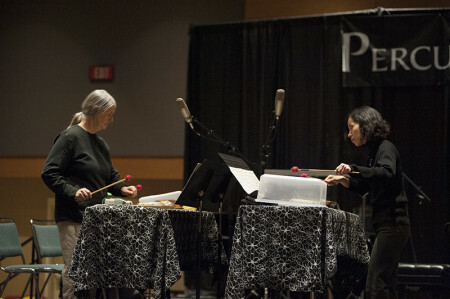 This concert is the Sylvia Smith Percussion Duo’s debut performance in Seattle. They will present the music-theatrical works for percussion instruments of Sylvia’s husband, Stuart Saunders Smith. Sharing the evening is local percussionist Dale Speicher, performing works by Tom Baker, John Cage, Udo Kasemetts, Dale Speicher, and Roger Zahab. The Sylvia Smith Percussion Duo, founded in 1998, is a women’s percussion duo centered around music that integrates percussion, spoken language and theater. Ms. Smith is also the owner and editor of Smith Publications/Sonic Art Editions, publishers of American art music. As a percussionist, Smith has performed at Merkin Hall in New York, the Percussive Arts Society International Convention, with the Merce Cunningham Dance Company and the Sylvia Smith Percussion Duo. Her performances are recorded on oodiscs and Eleven West Records. The recipient of numerous honors, Dr. Smith was awarded the American Music Center Letter of Distinction in 1988. Ayano Kataoka is a marimba specialist, beginning her marimba studies at the age of five, and is a graduate of Tokyo National University of Fine Arts and Music and the Peabody Conservatory in the United States. She has worked as a marimba soloist and percussionist in Japan and is recorded on Respect Records. She approaches percussion performance as essentially theatrical, using standard percussion instruments along with spoken voice, singing, acting, and elegant props. Their program features works by Stuart Saunders Smith (1948), an American composer, editor, and poet. Smith has created an unusual body of musical and literary compositions, encompassing the diversity of the contemporary music world. His interest in notation and indeterminate composition has developed into a kind of theater which reintegrates the arts at their compositional roots. The unifying thread in all of his works is a primary interest in the psychology of performance. Smith believes that each sound is intelligent and, when one listens to them, they can direct the course of events. So Smith listens to each sound until it tells him what sound should come next. Dale Speicher is a percussionist committed to presenting adventurous music by forward thinking composers from all over the world. Dale has performed with many talented musicians throughout his career, including most recently Tom Baker (Seattle) and Chris Leonard (NYC). When not performing, Dale is managing partner of Arundel Books of Seattle and owner of a music distribution company Algetic Media Distribution (AMD).